Musical Background: He was a scholar who learnt Vedas from Govinda Yati. He also learnt Hindustani music. Region: He was born in Tanjavur district. Contribution: He has composed many kritis, but his greatest contribution is the Nandanar Charitram, a Tamil opera. The story is built around Nandanar who was a Saivite saint. Bharati’s poetic genius, his expertise in portraying the various characters and his command over music makes the work a masterpiece. 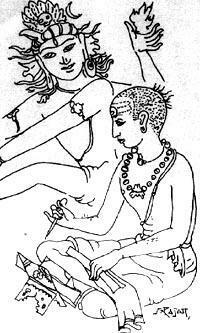 It is said that he met Tyagaraja and composed the song, Sabhapatikku (Abhogi). He has incorporated several Marathi musical forms like Ovi, Dindi, Abhang, etc., in his compositions. Theme: He employed devotional as well as social themes in his compositions. Signature: He used the mudra Gopalakrishnan. Popular Compositions: Varugalamo (Manji), Varuvaro (Sama), Enneramum (Devagandhari) etc.